Fishing is a great activity to pick up at any point in your life. Outdoorsmen young and old find pleasure in casting lines, connecting with nature, and bringing home freshly caught seafood. The first step in learning how to fish is getting the lay of the land. Do some research about the best fishing spots near you, and see what species you could potentially catch. If you're hoping to turn your day casting lines into a night of frying fish, be sure you choose a spot where you could encounter dinner-friendly varieties. Once you've chosen the perfect spot, figure out what climate offers the most bites, as well as what time of day tends to be most fruitful, and plan your first excursion with these factors in mind. When in doubt, Bass Resource recommended that beginners start with small lakes or ponds, which tend to be more conducive to learning. To ensure your first trip is as successful as possible, make sure you have the basics down pat before your hitting the water. Bleacher Report recommended taking time to practice techniques for baiting hooks, casting lines, and tying knots. If you plan to go fishing on a boat, make sure you're up-to-date on your maritime safety as well. Unsure where to start developing these skills? Try asking a friend who fishes, visiting your local hunting and fishing store, or searching for videos online. 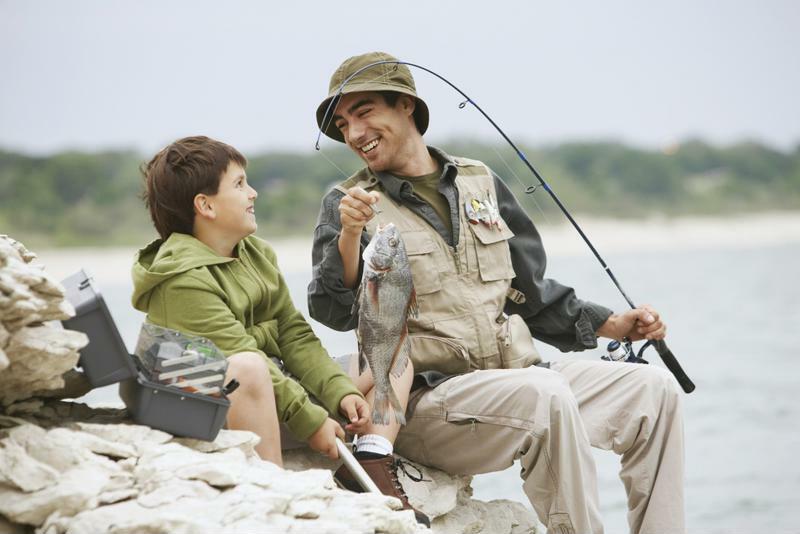 Fishing is a great activity for the whole family to learn together. It can be tempting to purchase the most impressive, open-faced rod you see, but skipping straight to the advanced equipment will only prevent you from progressing at a steady rate. Make sure that the tools you purchase, from rod to tackle box, are tailored to your needs and level of experience. Bass Resource noted that when it comes to bait, beginners are better off avoiding spinnerbait, as this variety is only effective when operated by experienced hands. Plastic and live worms tend to work best for amateurs, although certain types of fish require specific bait regardless of your beginner status. Catfish, for example, should be baited with chicken liver, while bream fish can be attracted using crickets, explained Bleacher Report. Fishing is all about patience and preparedness. And it becomes significantly harder to practice the former if you don't keep the latter in mind. Successful fishing excursions demand plenty of time and all the right tools, so make sure you're 100 percent ready before embarking on your trip. First, ensure you're outfitted in proper fishing attire. If you're fishing from land, be sure to wear boots, and if you're casting from a boat, wear footwear with plenty of traction. Protect your skin and eyes from harmful rays with sun block, sunglasses and a hat. Apply plenty of bug spray to your exposed skin, especially if you're setting up camp in a wooded or swamp-like area. Never go fishing without the proper preservation tools. When your catches are stored and packaged the wrong way, they could go bad, leaving your dreams of a homemade dinner cast aside. With The NEW FoodSaver® GameSaver® Big Game™ GM710 Food Preservation System, you can vacuum seal your catches on the go, locking in freshness and flavor for up to 5 times longer than other packaging methods.